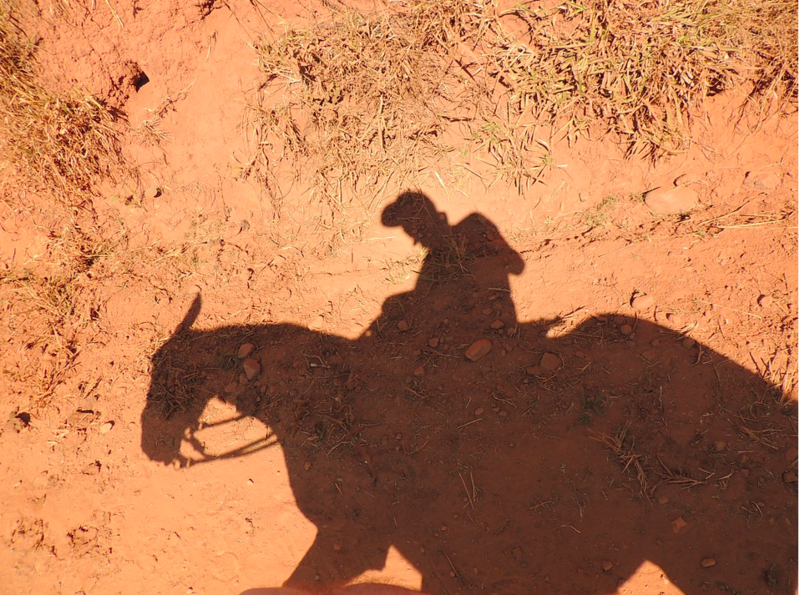 It's not all that unusual for men to avoid horseback riding because they experience that "special kind of pain" in the saddle--particularly when the horse begins to trot or canter. Embarrassment aside, heres how guys can avoid hitting their testicles when they ride. 1. Wear a jock and/or jockey underwear rather than boxers to keep everything up close to your body. 2. Fix your riding posture. If you are leaning forward in the saddle at all, you will get smacked when you sit the trot or canter. You should check whether you are sitting on your seat bones with your pelvis slightly tucked under you. Women typically sit with very arched backs, which means they are sitting directly on their crotches. When the horse trots or canters, this is extremely painful, and can even cause bleeding. When a man sits this way, he will get smacked in the testicles if he sits this way. Ouch! If you don't know where your seat bones are, do this: Sit on a hard surface like a coffee table. Flatten your back by rolling your pelvis under you, then arch your back so that you are sitting on your crotch. Do this several times in succession until you feel what happens to your seat bones when you do this. You will find a balance point where you are sitting directly on your seat bones rather than on your crotch or your back pockets. That's were you need to be when you ride. You also need to have a "soft" pelvis that flexes with the horse's back in trot and canter. If you are stiff through your back and hips, the horse's movement will cause you to bounce up and down in the saddle, hurting you and hurting the horse's back. ​The other problem is usually that we are so used to sitting in chairs that our hip joints don't open up as much as they should when we are in the saddle. Your heels should be directly under your hips when you are in the saddle, but most people sit as though they were in a chair: Their hips-thighs form a sharp angle, like an "L", the way they do when you sit in a chair. Your hips can't flex with the horse's back when they are positioned this way, which means that you are going bounce badly. To get an idea of what I mean, sit in a chair and then try to roll your pelvis forward and back (like you're doing a bump and grind dance movement). You can't. Now try standing up with your heels directly under your hips and try doing the same thing. No problem. Your hip joints have to be open like this when you sit on a horse. Find a good trainer who will help you practice on a longe line until you find your seat. Riding shouldn't hurt. It should feel just fine in all gaits. Here are more great articles about developing a comfortable and secure riding seat. Three secrets to developing a secure seat. We thought you might be interested in these quality items.